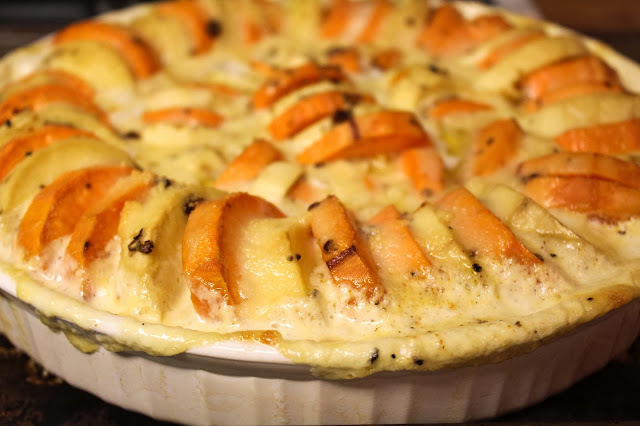 So "gratin" just means dish cooked with a browned crust, often with cheese. Therefore gratins are good. Like really good. The last recipe I posted, the Collard Greens Gratin, is my new favorite gratin... this is my long-time fave gratin. 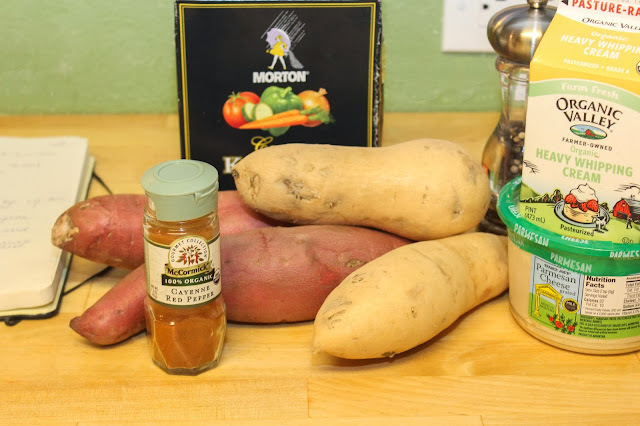 These sweet potatoes (both colors are sweet potatoes, but sometimes they are called yams by color) are cooked in cream with a browned topping made from Parmesan cheese and spiced with simple ground peppers. 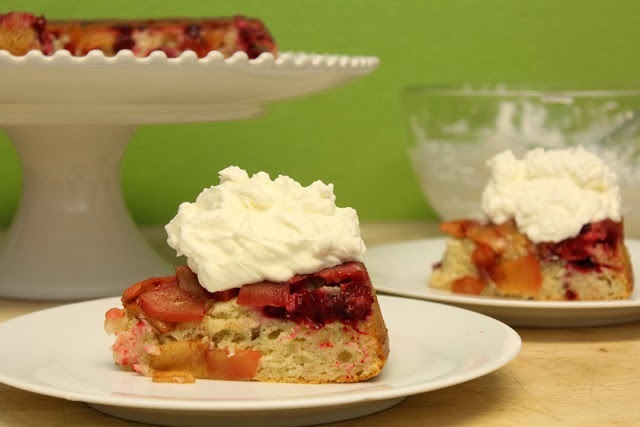 The recipe is VERY simple, but super delicious, very rich and very amazing. My dear friend Betsy gave me this recipe a few years ago, and I make it for special occasions and, of course - THANKSGIVING! With 1 tablespoon of butter, butter a 9x13 inch glass dish, or other shallow baking dish. 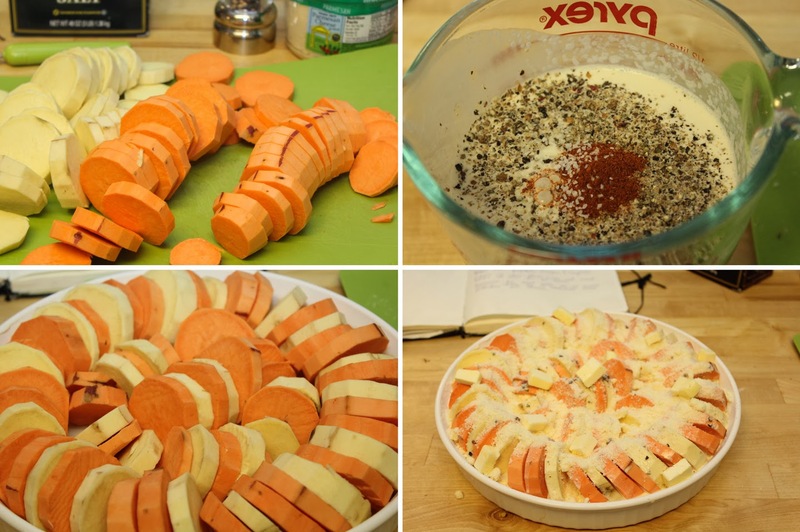 Arrange potato slices in a single layer and top with 1/4 cup of cheese. Repeat with a second layer or until all of the potatoes are used. Hold putting on the last 1/4 cup of cheese. I like to make alternating rows, or concentric circles, alternating colors so this dish is really pretty when it bakes up. In a measuring cup, combine cream, salt, pepper, and cayenne. Pour the cream mixture over the potatoes and sprinkle on the last quarter cup of Parmesan cheese. Dot with the remaining 1 tablespoon of butter. Cover the dish with foil - dull side out - and bake for 20 minutes. Remove the tin foil and bake for another 20-25 minutes until potatoes are tender. Cool a bit and ENJOY!! You can use all one color potatoes if you have a preference. This dish will take a few different temperature variations... I've cooked this with a turkey in the oven cooking at 350. Just increase the time cooked with the tin foil on. Don't use milk or half and half. Use heavy cream. It's worth it. Next up on the Thanksgiving round up - Sage Rubbed Turkey Breast with Apple Cider Pan Gravy. Oh my goodness - that's a good cake! !